Light stations were designed to provide warning and guidance. In our own way bloggers, analysts and journalists do the same thing. The thugs above, captured by Jim Wilson only a few hours north of Cambria are another blight on the American dream. They have historic cousins. 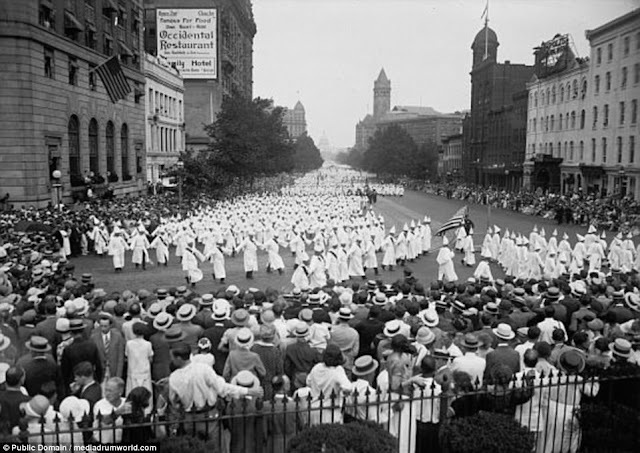 The first Klan march and rally I covered was 1965. I thought the men and women who marched with their faces covered were cowards. I think that still, regardless of the cause that puts a person in the streets. That is true for the violence prone troublemakers Antfia-or antifascists. 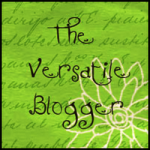 A quick and personal digression. My late brother was a political "radical" of the SDS persuasion. He was part of the "Days of Rage" and shared the Weatherman philosophy. He believed you fought violence with violence, when necessary. We had many long probing conversations and debates. He did not believe in starting a violent act, but he did not buy the idea of civil disobedience or non violence. A police night stick, or tear gas prompted an in-kind response. But one thing he would never do, was cover his face. He too thought that was cowardice. He marched, shouted and raged without masking himself. I covered many anti war and civil rights marches and demonstrations. I've been stung by tear gas, was hit on the head and knocked to the ground by a stanchion bearing a Viet Cong flag, was slammed up against a bus and kidney punched by an out of control cop who didn't want a reporter documenting his beating of people in a round up. I understand the passion that put people on the front line of divisive issues. To cover your face is absolutely wrong and anti American. Anarchists have been a part of life around the planet for centuries. They created particular havoc in the US in the early 20th Century. Few US citizens realize how many bombings took place in those days. 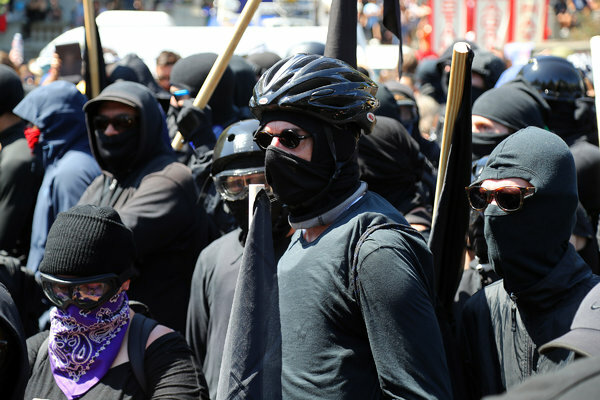 Antifa is a modern iteration; Autonomous groups that think fascism is so evil that violence is a proper recourse. They are themselves fascistic in their methods of opposing particular ideologies. They are not liberals, progressives or even left wingers. They are a self righteous band of violence prone, anarchists who see themselves as a kind of vigilante force. Berkeley Mayor Jesse Arreguin has seen their influence. He says antifa gives the peaceful leftists a bad name. "It played into the false narrative that some conservatives have spun" about violent left wingers Arreguin told the Associated Press. He watched as antifa attacked protesters. 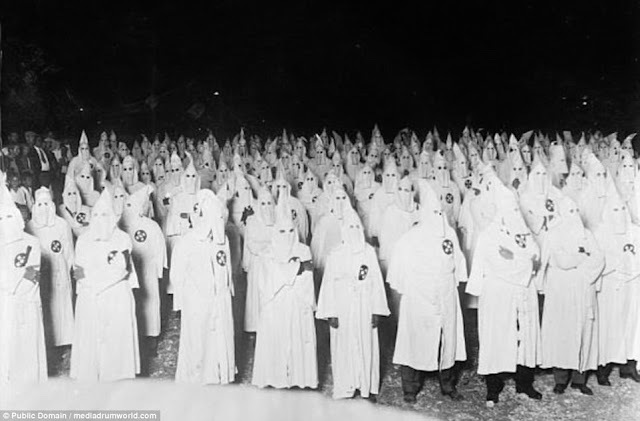 Whether in klan hoods or antifa black, they are extremists who have convinced themselves direct action solves issues of understanding, education, bias, predatory capitalism, ignorance and other evils. No one who covers their face deserves respect, nor should they be permitted to further degrade an already weary democratic republic. We have problems to solve. Our thoughts and prayers are with the people of Texas, Louisiana, Mumbai and India. For those of you with family or friends in those areas we hope you hear from them despite the heartbreaking news about loss of homes and property. I recently posted a picture of my youngest, taken during the WTO debacle in Seattle. She is sitting in the middle of a line of masked demonstrations, bare-faced, not even a hat to hide her then flaming red hair. You know my views, I fully understand the antifa's rage, I was a 'member' of the VVAW back in 69-71. Were I that age now, I don't know where I'd fall on the spectrum out there. Also, look up the number of people killed by right wing nuts since 9/11. Then look up the number of people killed by antifa and their type. A hint: the last number is zero. The first is over 60. 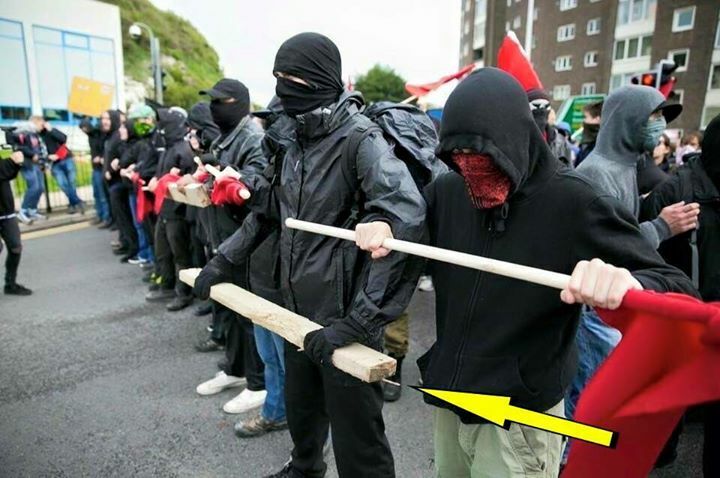 I'm not saying Antifa does not identify a real enemy. It's their tactic I question. As a general thought, the far right extremist is more dangerous than the left. Remember who did the night rides and the lynchings. There's so much bad news hitting us from all angles. I know life and civilizations have their ups and downs, but I wish we could get back the balance we once had, or at least pretended to have.